Thailand lies in the middle of the Indochinese Peninsula in Southeast Asia, with coasts on the Andaman Sea, to the west, and Gulf of Thailand, to the east. The twentieth most populous country in the world, famed for its cuisine, exotic landscapes and Buddhist statues, boasts an assortment of touristic allures, enticing over thirty million visitors each year. Blessed with some of Mother Nature’s finest achievements, Thailand is, first and foremost, a mesmerising paradise, jam-packed with picture-postcard backdrops. Jungle-covered islands fringed by dazzling white beaches occupy both sides of the Malay Peninsula, with Ko Samui and Ko Pha Ngan, home to the Full Moon Party, grabbing most of the limelight, and tourists. Lesser known Ko Lipe has gentle surf breaks, while nationwide you can find world class diving sites, with optimum conditions falling from November to April, when visibility can reach thirty metres. The nation’s capital, Bangkok is a sprawling city of contrasts, mixing towering skyscrapers and a prominent clubbing scene with authentic canals, majestic places of worship and streets populated with food carts. 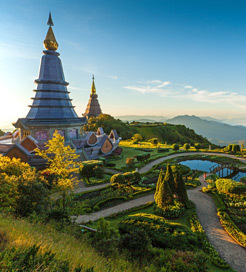 Chiang Mai, the de facto capital of the mountainous northern region, is known for its vestiges of centuries-old walls and moats within the Old City, and for hundreds of spectacular temples. Krabi Province, on the southwest coast, is a top rock-climbing destination lined with steep limestone cliffs and dense mangroves, offering a gateway to the popular Phi Phi Islands. Buddhist in nature, Thailand is a place for meditational retreats as much as beach resort holidays. Thai temples, known as ‘wat’, are both opulent and widespread in equal measure. The most sacred of all: Wat Phra Kaew, in Bangkok, features the famous Emerald Buddha within its fabulous walls, but the ‘marble temple’, also in the capital, is arguably the most attractive, adorned with quintessentially Thai-style gables, stepped-out roofs and intricately decorated interior. What are the ferry options? With the majority of visitors coming to Thailand for the stunning islands and archipelagos, travelling by ferry is one of the most prevalent means of transportation. A huge selection of companies provide regular, reliable and high-speed connections between all the best Thai destinations, with ferries interlinking the popular islands of Koh Tao, Phuket, Koh Samui and many more with the mainland. International crossings from the Malaysian island chain Langkawi are also available. For more information, please visit our Ferries from Koh Kood to Thailand page. For more information, please visit our Ferries from Koh Mak to Thailand page. For more information, please visit our Ferries from Koh Phangan Island to Thailand page. For more information, please visit our Ferries from Phi Phi Island to Thailand page. For more information, please visit our Ferries from Koh Samui Island to Thailand page. For more information, please visit our Ferries from Koh Tao Island to Thailand page. For more information, please visit our Ferries from Langkawi Island to Thailand page. For more information, please visit our Ferries from Langkawi to Thailand page. For more information, please visit our Ferries from Phuket Island to Thailand page.